What happened when Keith from Castle Comfort offered to help ease the financial burden of a stairlift by offering a £50 money back voucher for his customers? Read on to find out. Many people looking for good value when shopping will be on the look out for those people and companies that look genuine and sound honest in their dealings, whether by phone or in person. It is our right as consumers to choose who we do business with and most people can spot a rogue trader a mile off. Whether their stock is "knock off" or maybe they give some change back in counterfeit cash leaving the poor shopper out of pocket and ripped off. In 2009, Bank of England figures revealed 566,000 counterfeit notes in the UK. Of these, 95% were twenty pound notes. So approximately 1 in every 5000 notes is a possible forgery. Well, what we didn't expect was an email from the Bank of England themselves saying that our novelty notes weren't a laugh at all but could pose the risk of being printed out and used by unscrupulous people as real cash in the shops. Some people could have printed off hundreds of them and paid cash in fifties for something expensive and in fact the reason for the law being made was because that had actually happened. We can see their point, however everyone knows that people always prefer the genuine article than a fake one. Official protocol from the Bank of England states that we had to remove all the novelty notes from our blog so I cannot show you a picture of one here on this page anymore. To do so would risk us all doing a few years at Her Majesty's Pleasure for counterfeit note production! 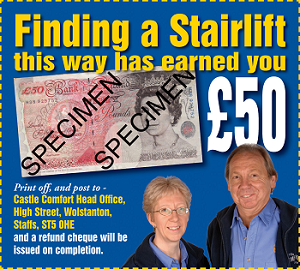 However if you look at the amended and officially allowed £50 voucher above and imagine a picture of our own local Stairlift King (Keith) superimposed on it instead of the Queen you will have an idea of what our funny money looked like. If you want a genuine no-nonsense stairlift quotation, with no funny business, and to also take advantage of a real £50 money back offer on your order, then speak to us for the real deal. Just call 0800 007 6959 today.